Welcome, I'm Lars Walker, fantasy author (Lars Rhymes With Farce, Not Cars ). Welcome to my website, where you can learn all I choose to tell you about myself and my books. I'm the author of a series of historic fantasies about Erling Skjalgsson, a great Viking lord, and some loosely connected fantasies based around Epsom, Minnesota. Get a taste for these novels on the books page. Be sure to check out my blog at Brandywine Books! You'll get the latest news from me there. Besides being a novelist, I’m a Norwegian translator. I’m very proud of the recently released work, Viking Legacy, by the Norwegian scholar and historian Dr. Torgrim Titlestad. Viking Legacy is a groundbreaking book that makes two controversial claims. First, that the Icelandic sagas provide useful information that can be useful to historians, if handled with caution. Second, that we owe our western ideas of democracy at least as much to Viking legal tradition as to ancient Athens. 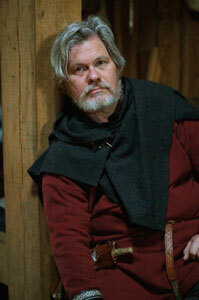 I might also mention that Erling Skjalgsson, the hero of my Viking novels, is a prominent character in this work. I first became acquainted with Prof. Titlestad though our mutual interest in this larger-than-life saga character. In the near future, suicide is a constitutional right. Tom Galloway is an ordinary single father, just trying to keep his rebellious and depressed daughter from going to the Happy Endings Clinic. The last thing he needs is a ninth-century Viking time traveler dropping into his life. But Tom is about to embark on the adventure of his life. One that will change the world. The other is the worldwide expansion of Islam, particularly in Europe, but also in America. Gene Veith says, "It’s suspenseful, exciting, and wildly imaginative, both in the author’s story telling and in the way it stimulates the reader’s imagination." My latest book continues the adventures of Erling Skjalgsson in Norway just after 1000 A.D. Hailstone Mountain is an H. Rider Haggard-esque story, in which Erling is struck by a curse that could kill him slowly. In order to break the curse, he must sail north (along with Father Ailill, Lemming, and others) to confront the source of the magic face to face. Meanwhile, Lemming’s niece Freydis is kidnapped by her relatives from up in Halogaland, and it’s not a nice kind of family, so she must be rescued. And that sets off repercussions that could destroy the whole country. Erling must join forces with a bitter enemy to stave off a monstrous horror. I can tell you are a discerning reader. That's the reason I can recommend Troll Valley, my first e-book. It's the fairy tale your grandparents never told you. Your childhood has been shafted until you read this book set in 1900 southeastern Minnesota. It follows Chris Anderson, who is a unusual farmer's son. For one thing, he has a deformed arm. For another, he has a fairy godmother (not the Disney kind). He's also bedeviled by apparitions--red, pointed Norwegian caps which dance around him on the ground when he allows himself to get angry (for which reason he always stuffs his feelings. Sort of the perfect Norwegian). 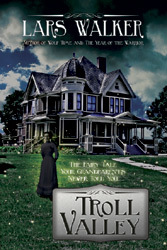 Troll Valley is available through Lulu.com or look for it in the iBookstore, B&N, or Amazon. Of course, these other titles are good alternatives. The good people at Baen Books are selling four of my books and e-books directly. Buy them here, and consider giving them as gifts to your discerning family and friends for whatever holiday is just around the corner. Late Christmas presents are always welcome, and don't forget gifts for Valentine's Day, St. Patrick's Day, various parent days, birthdays, U.S. congressional holidays, Norwegian Constitution Day, and tomorrow--all great days for giving. You may also buy any or all of them from through Amazon. Q: Your Erling books concern an Irishman living in Norway. You have an Irish last name, so I assume your heritage is Irish-Norwegian. Right? A: Wrong. One of my Norwegian great-grandfathers took the name Walker more or less at random after arriving in America (which was rather courageous of him, considering he couldn't even pronounce the letter “W”). I confess to being a quarter Dane though. 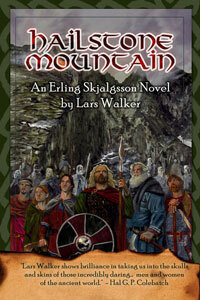 Lars Walker, author of historical fantasy and viking reenactor, is the subject of larswalker.com. You can write him directly at lars@larswalker.com. You may be able to reach him right now by commenting on his blog, Brandywine Books. Header photo of ships on the water by Marit Synnøve Vea.